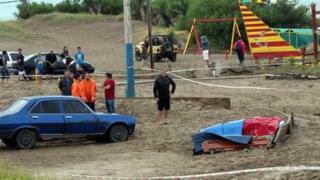 A lightning strike has killed three people and injured more than 20 others in a coastal town of Argentina. Reports from Villa Gesell, south-east of the Argentine capital, Buenos Aires, say the victims had been sheltering from a storm on the beach when the lightning struck. Eyewitnesses spoke of a "terrible noise" and said some people were thrown in the air by the powerful bolt. Many of the injured have suffered burns, two of them seriously. "Most are out of danger, but there are two adult women in intensive care," said Juan Chamorro, the head of a local hospital. Those who died were aged 17, 19 and 21. The beach town of Villa Gesell is located about 300 km (200 miles) from Buenos Aires.